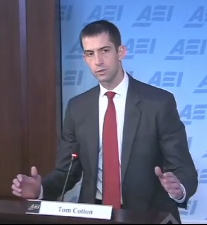 Representative Tom Cotton (R-AR) delivered the keynote address today at the American Enterprise Institute (AEI) where he discussed the new threats that the U.S. faces from Al Qaeda and radical Islam. The first-term Congressman is a rising star in the Republican ranks and is challenging Senator Mark Pryor (D-AR) for his seat in 2014. His resume is even more impressive: graduate of Harvard University undergrad and law school, clerkship on the U.S. Court of Appeals and time at McKinsey & Co. But what Cotton values most, and talks about frequently, is his time in the Army in both Iraq and Afghanistan. That’s how Cotton began today’s speech as well. Cotton praised AEI for the organization’s contributions to the Iraq Surge and then shifted from talking about his military background to the main theme of his speech: the growing threat of Al Qaeda. Rep. Tom Cotton speaks at AEI. Before 9/11, few people were aware of the threat Al Qaeda posed to the United States, he said. Afterwards, that quickly changed as the U.S. joined the war against radical Islam. Cotton emphasized that the U.S. joined the war, which radical Islam had started decades earlier. It had taken the United State an event as tragic as 9/11 to get it to stand up and fight, despite repeated terrorist attacks during the 1990s. Cotton worried that a similar complacency and disregard for Al Qaeda was setting in on both lawmakers and the American people in recent years. Cotton stressed that Al Qaeda has grown in strength over the past four years due to the Obama Administration’s neglect for counterterrorism policies. For years, the U.S. military had kept Al Qaeda in a defensive position, pushing them into the hills of Afghanistan where it was near impossible to coordinate a terrorist attack. The United States was the “strong horse” and Al Qaeda the weak, he said. *Cotton published an op-ed with Rep. Mike Pompeo (R-KA) supporting Obama’s plan for Syria a week ago.